Blue Ridge Research and Consulting, LLC (BRRC) is currently seeking an acoustical engineer for our Asheville, NC office. This position involves conducting research in a wide range of environmental acoustic areas including sound and noise source measurements, general and specialized modeling, soundscape and transportation noise visualizations, and outdoor warning system design. Current research areas include noise source characterization of military aircraft and rockets, long-range sound propagation modeling, and operational noise reduction studies. Responsibilities involve applied acoustical research as well as interacting with clients, noise analysis modeling, and technical reporting. Skills – Applicants must be team oriented, have excellent oral and written communication skills, and enjoy working in a high-energy environment. Further, applicants must possess strong analytical and computer skills to solve unique and challenging problems for both the military and transportation industries. Computer programming skills, particularly in MATLAB, are required for success. Proficiency in the following programming languages are preferred: FORTRAN, C++, C#, Python, SQL, and VB. Experience – A minimum of two years of experience (or a Master of Science) conducting acoustical research and consulting is required. A working knowledge of outdoor sound propagation, measurement methods, and signal processing techniques is preferred. Additional experience with industry standard transportation noise models and GIS analysis is preferred. More experienced candidates, who have a desire to lead projects, expand current lines of work, and explore new technical areas are also encouraged to apply. Previous experience interacting with clients, conducting business development, and writing proposals is also preferred for more experienced candidates. 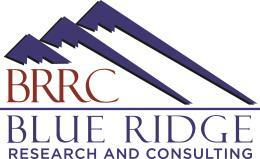 Explore BRRC projects at BlueRidgeResearch.com. Education – M.S. degree in physics or engineering disciplines is strongly preferred. Basic Requirements – Due to the sensitive nature of BRRC’s defense-related projects, U.S. Citizenship or permanent resident status is required. About Us – BRRC is a small, dynamic firm located in the mountains of Western North Carolina. We specialize in aviation environmental noise studies and acoustic research and consulting. Our projects range from environmental noise modeling to large research projects and SBIR programs. BRRC encourages innovation and excellence in its work, and emphasizes professional advancement for its staff. We offer a competitive compensation package that includes healthcare, long-term disability, 401k with matching, and merit bonuses.